The Shafter Trail (AKA South Fork road, AKA Potash Road) leads from Moab to Canyonlands via the direct route- along the Colorado River gorge and up the side of a serious cliff. After some great views of the Colorado river gorge, the road comes right up to the cliff at the 'Goose Neck'. Here the passenger's side of the Jeep (out of view) is within 6 inches of the base of a cliff. 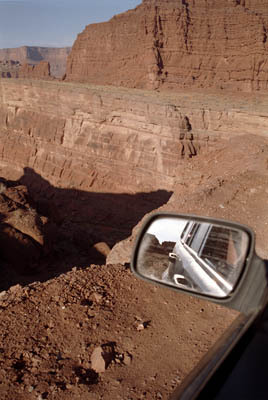 The driver's side mirror, shown here, is within about 2.5 feet of the top edge of a sheer cliff. Big deal, right? Err, no. That's a ~1000 foot drop, straight down, and right into the river!